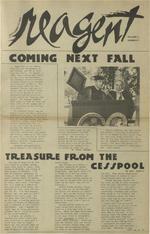 Twelve page issue of the student produced newspaper. ---The Co-Op Lives!bycarrieKastnr .. Hungry? Sick of Yerry's and tired of the weekly trudge to Winn-Dixie, Home of the Hormone-Injected-PesticideInfected Tomato? Or take the more wholesome products available to the conscientious and extremely wealthy at the Granary: look, no matter how good those groceries are, you will definitely end up gagging over the prices, right? Here at New College, right down YOUR block, we have an alternative to both aches and pains. The organization known as the Happy Carrot Food Co-op is just that. Here you are given the option of healthful, organic foods at prices you can afford. (We should make a commercial.) In the past the co-op has ordered a list of natural foods every two weeks and distributed them among members accordingly. Each member has been expected to pay a fee of $15 upon joining ($10 of this is refundable when one withdraws from the group), and to attend meetings fortnightly and work a minimum of four hours per month, just keeping shop. Basically, the co-op is justly named. It is a group of concerned coming together to help provide a service that we all need. In this case the concern is for health and group support, and the service Crud And is what, class??? GROCERIES! Some import-ant changes have been made this year; hopefully, they will have positive effects on the entire New College community as well as 'On the co-op. Most obvious' is the fact that it has grown in human resources: those of you who recall last year's membership will be amazed at this year's thirty-plus, a good many of whom are new students. This will raise the group's capital for initial ordering, but the money is still a problem until things get somewhat smoother (we hope) into the year. Another change is the addition of Coca-cola products and candy to our inventory--these will be sold at lower-than-vendingmachine prices, to give everyone a break. The store-front hours will be lengthened throughout the week, and sales extended to non-members at a slightly higher cost. There will also be evening hours to serve USF night students who have expressed an interest. What we need now is more participation. Last year most New College students knew that there was a co-op; we just didn't know when or where the goods were available. Most of us didn't realize how easy it is to be a part of the The Green co-op. Many still don't; that's why I'm writing this article in the first place. The same requirements for membership hold, but this of effort is so minimal in return for what we all can get in return--not to mention a more satisfying means of doing the grocery shopping. For those of you who are new to this great revelation and don't have any idea of what you can expect to find at the co-op, regular items include various types of cheese (including goat's-milk), apple juice, tofu, whole grain products, breads, nuts, and dried foods. The entire list is quite lengthy, and, of course, if you are a member you can order any item from the miscellany. So whether you are a Marxist a vegetar1an try1ng to avoia ulti-mate starvation, or someone who just wants some decent food in its natural state without the prices that accompany such luxury, at least g1ve the food co-op a try. The first load arrives Monday afternoon, so you can usually find someone in room 207 after that time. Start attending the meetings, too, if you are so inspired. S 1 U d ge by Randall Lanier This is the first of a .structural changes that occur pump shaft seals, and multi-part scheme created to cause the fuel to swell thus other equ1pment that cannot be frighten, enlighten, and moti-producing cracks and practically made 100% leaktight. vate you into developing a in the fuel material All of These leakages are known as 'iden-stance on the different types these changes tend to place tified leakage' and should be .. to ;auks or sumps so that sides Of any issue will be pre-may break or lose its integand monitored during pLane sented in the future. Unforrity. The fuel is desigded to eration to the extent practical. tunately, that is not the case operate for a given period with Any leakage released directly to here' but all rebuttals and 1 1 f the containment environment and on y m1n1ma allures, but even responses are welcome. Rather th which is not collected is known so e escap1ng f1ss1on products 2 than dwell "'n the horror of k as 'unidentified leakage.'" w may ma e a maJor contribution to accidents, which most of you the radioactivity released in For pressurized water re-probably know enough about the effluents during normal.op-actors, the NRC assumes a leak-anyway, I've chosen to write erations." 1 age rate of 240 pounds per day on routine "low-level" reSome fission products escape of primary coolant into the leases of radiation during the as gases, dif=using through the containment building; 160 pounds normal operation of a nuclear cladding and into the coolant; per day of primary coolant to the power plant. some through or tiny auxiliary building; and 1700 First of all, the so-called pin-holes; and some through pounds per hour of secondary "closed cycle" cooling systems f 1 ld coolant steam into the turbine au ty we s. The Nuclear Reg3 of nuclear plants are not really ulatory Commission (NRC) has building. Ventilation air closed. Some radioactive mate-begun to allow nuclear plants from these buildings is fre-rials .generated in the reactor to keep fuel rods in the reactor quently released without treat-vessel leak within the plant and vessel for as long as six years, ment. are released to the air and water as opposed to the three year Since the primary coolant regularly (every day). Some are ave:ag: of the past. The Zion, is radioactive and leaks to the removed by filters and demineralplant is one example. secondary coolant system, which, izing resins, or evaporated to a Needless to say, the longer the in turn, leaks, and since the sludge, all of which must be. rods remain in service, the ventilation air is generally on-stored as "low-level" waste. greater the chance of de"ferioratreated, it seems obvious that As the primary coolant cir-tion and leakage. So the primary radioactive gases are routinely culates around the fuel rods in coolant becomes irradiated. Now released into the atmosphere. the reactor vessel, the steam what? The effects of these and other generator tubes, and back into Just as builds up routine releases will be dis-the vessel, it becomes radio-1n regular plumbing, so it does cussed later, as I'm out of room, active to varying degrees, de-in nuclear plumbing. The metal but you can bet they're not harm-pending on how many leaks are oxides which build up on the less! Cover your gonads present. primary cooling surfaces, i.e., The fuel rods are one of the reactor vessel, the piping, the primary sources of leakage. heaters, pumps, fuel rod clad-Each rod contains about 150 ding, control rods and so on are ce::amic uranium pellets stacked officially called "crud." In end to end, each approximately the secondary system, the cor-the size of a cigarette filter. rosion products are called "the The core of a typical 1000green grunge." While some of the megawatt pressurized water corrosion products precipitate out reactor contains about 50,000 or slough off into the coolant, fuel rods. During fission, others continue to accumulate, the uranium breaks down into causing the equipment to clog, hundreds of fission products, dent, or break. all of which are radioactive. "It is recognized that a The "cladding" of a fuel rod limited amount of leakage will is about 12 feet long and is occur from the reactor coolant constructed of a zirconium al-system and from auxiliary sys-loy about 0.02 inches thick. the contAinment irradiation the through valve stem packing glands, Footnotes 1 Atomic Energy Commission publication: Meteorolo9y and Atomic Energy, l968, Dav1d Slade, ed., p. 315. 2 NUREG-0531: Investigation and Evaluation of Stress-Corrosion Cracking in Piping in Light Water Reactor Plants, NRC, February, 1979, p. 85. lwASH-1258, Vol. 2, Appendix B. OF THE llORE N IIIRLINE TRIIliEOif the Soviets have been suspiciously quiet about the entire affair. Compare that to the barrage of speculation our newspapers have filed as news and the tiring rhetoric from the White House. One thing remains clear: there are no real, definite facts, only a supply of propaganda. Formulating a conclusion from this distorted view of the situation can only lead to trouble. Maybe we should try to understand how the incident occurred from the Soviet point of view. Is it possible that they believed that hostile actions were being taken by the Korean jet? Or is it, as Mr. Reagan seems to imply, that the Soviets shot down a passenger plane just to see it light up the sky? This attitude of. disdain towards the Soviets only results in worse relations between the two nations. Why do we persist in viewing the Soviets as satanic beings? Does anyone honestly, rationally believe that? Perhaps if we stopped hating them, they would stop hating us. When analyzed, it appears to me that neither government is the slightest bit concerned with bringing the two nations closer together. Neither has come close to telling a truthful, unbiased account of what happened and they seem to have no plans of doing so. We'll probably never know what really happened. We should, how ever, remember the dead and mourn for their families and ins t e ad o f passing the blame back and f o r th, we should take efforts to see that nothing of the sort happens again. And, more that this tragic I Lawrence Moose (student): "In my opinion, the Soviet action was completely unwarranted and seems to be a vicious attempt to intimidate. There is no excuse or rationale for murder--and that's exactly what it. was." ''We are tired of lies and halftruths The world demands that the Soviet Union take steps and give assurances so that the events of August 31, 1983, do not happen again." Stu dents listen, half-heartedly, to the voices that come over the TV. Voices. Empty voices. In the face of the situation, however, the atmosphere at New College is virtually explosive. 11Let1s bomb the first commercial Soviet flight that comes into N. Y .c.! 11 one student jokes. Similar suggestions abound. For the most part, howeer, students here view the issue as extremely serious and hav e searched themselves for some sort of response or possible explanation. Many people expressed their disgust. One student said, "Even i f it was a mistake, I still thi nk it's terrible. All those people who were killed! You'd think they (! :he Russiani) could have had some compassiono" A minority, however, feel that the Russians were justified in their actiono According to one student, "They got what they deserved," because they were violating Russian airspace. Others questioned the Russians' motives. "They admitte d today Q>ept. 6] that t hey shot the plan e d o w n," e xp lained Jackie Smith "I d o n t see how they could have mistaken a Boeing 747 for anything but a passenger plane. They'd tracked it for several hours--they had to have known they just got paranoid situation." Another student seemed to accept the event at face value. ''Although Russia's policies are different from ours, I don't think this--in the larger, political sense--is only something they have done. Every country has committed 'indiscretions'. It doesn't mean that the Russians are. ready for war." War! Revenge! Action! A wide diversity of opinions exist within the college community as to what measures the U.S. should take in retaliation. Bob Freedman, a student from Canada, mentioned the fact that Canada has forbidden.Soviet planes to enter the country in direct response to the fact that several Canadians were killed aboard the Korean flight 007. However, he feels that this action by Canada is not strong enough, and points out the fact that the u.s. seems to be doing nothing at allo Many are qf the opinion that action should be taken. But just how far should the U.S. go? Caroline Miller feels that "it. does not matter whose plane it was. The fact that several hundred unarmed 1ans were killed. I do not think this should affect the nuclear arms talks. However, I do think some diplomatic and military recompense should be made. I feel strongly that the talks should not be cut off at this time because this situation merely serves to emphasize how much we need to open communication." Scott Hines, however, takes a completely opposite stand. "The U.S. should take n o action because the u s was involved as far a s we k n ow. Th e fact that there were thirty-p l u s Amer icans o n board (including one Congressm an) do e s not change the diplomatic issues volved. The U .S. should not set punishment to like bad boys." The fact remains that New College, as a diverse body of.students, represents a potpourri of 1deas, opinions, values, and emotions. llllllRIELLE JIIIIL . I I If you're in polarity, you're creating polar opposites. You can only protest effectively when you love the person whose you are protesting as much as you love yourself.